Something personal: I had a wonderful Mother’s Day, mostly because there was no plan. Jeff let me sleep in and then have a free afternoon. He even locked the kids out of my bedroom while I was trying to shower — ahhhh, peace. 🙂 We had a wonderful family breakfast and peaceful family dinner, AND Jeff did the laundry. Seriously – does it get any better? As I was running some errands, I found myself noticing every woman that walked by. Was she a mother too? What has happened in her life? What kind of struggles has she been through? It brought to my mind how lucky I am, and how very hard this holiday must be for many mothers who have lost a child, or women who have never been able to be a mother. And, of course, it made me think about my own mother. A single mom who sacrificed so much to provide safety, food, and shelter for her young child. To be a mother is the only way to truly know the depth of love, happiness, guilt, frustration, and all the other emotions that consume a woman about her child. It’s profound. It’s amazing really. I am proud to be a mother, and so very grateful for my family. Even if I’m doing it all wrong, I do it with love, and that’s all that really matters. In appreciation of the wonderful moms that I have worked with – here is a little gift. It’s really just a gift of time (which always seems to be in scarce supply). I have designed a simple magnet that can be used for your teacher gifts. You can insert it with a card, or punch a hole and use it for a gift tag. I will send you the pre-designed file and you can simply upload and order your magnets – and they will arrive within a couple days from Mpix.com. 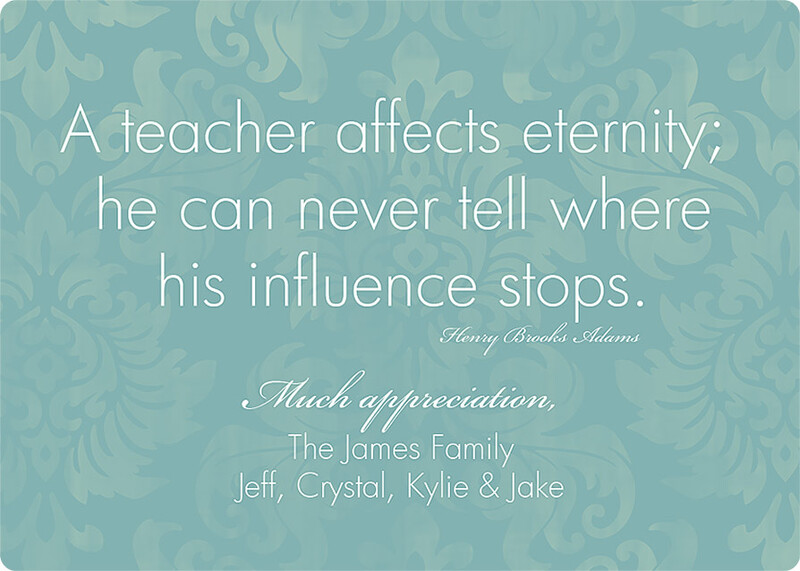 So, if you have ever had a session with me AND you want to order yourself some personalized teacher gifts – just send me an email with the quote you want and the greeting/names you want. Deadline is THURSDAY, May 12th. Cool Shopping Find: I really love the spring collection from INC at Macy’s. Oh how I would LOVE to go treat myself to a few new outfits! I couldn’t copy the pictures in for you, but I really love the black & white tank with rosette collar, and the pink/gray maxi dress. Welcome spring!!! And last but not least, a quick snapshot of my family from this weekend. 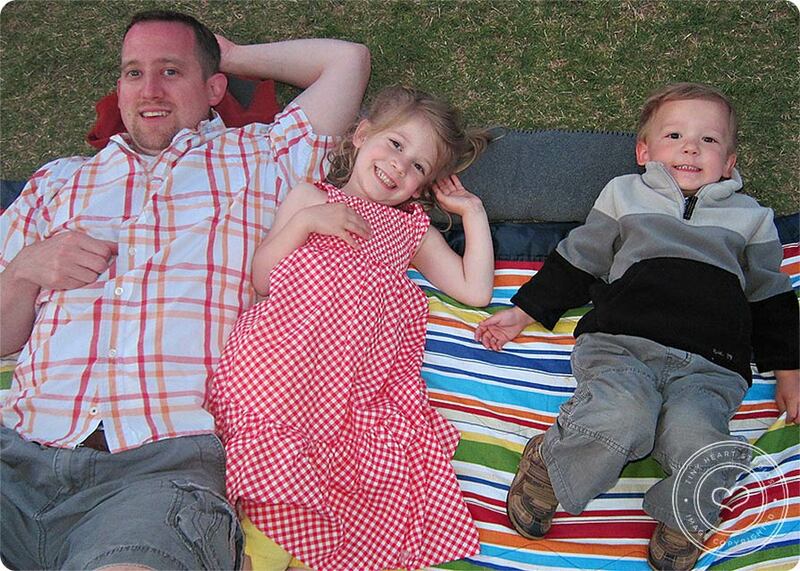 Taken at dusk at Taylor Brawner Park – right before the movie “Tangled” started. Sorry for the poor quality, point & shoot cameras can only do so much….. 🙂 Can you just hear them saying “cheeeeeeeese”? Jake has gotten really good at that. LOL!